Hi friends! Welcome back! New week, new celebration. These past few weeks have been so fun to create for my blog because there has basically been something to celebrate every week! 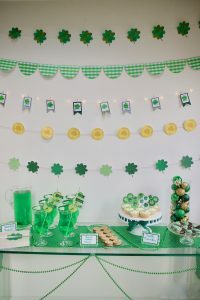 It started early February with the start of the Winter Olympics, then Valentine’s Day, then I had this awesome baby shower, then Mother’s Day, now St Patrick’s Day and from next week onwards we’re counting down the days til Easter!! 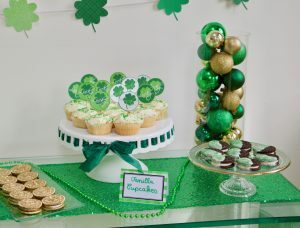 So this week is obviously all about green and St Patty’s!!! I’m so happy to have collaborated with Christina from Sunshine Tulip Design for this event. She has an Etsy shop and sells super fun printables for pretty much any occasion!! Printables are literally a life saver when you’re out of time and out of ideas because you can pretty much have a whole theme set up in a matter of minutes: choose your theme, click print… and that’s it! 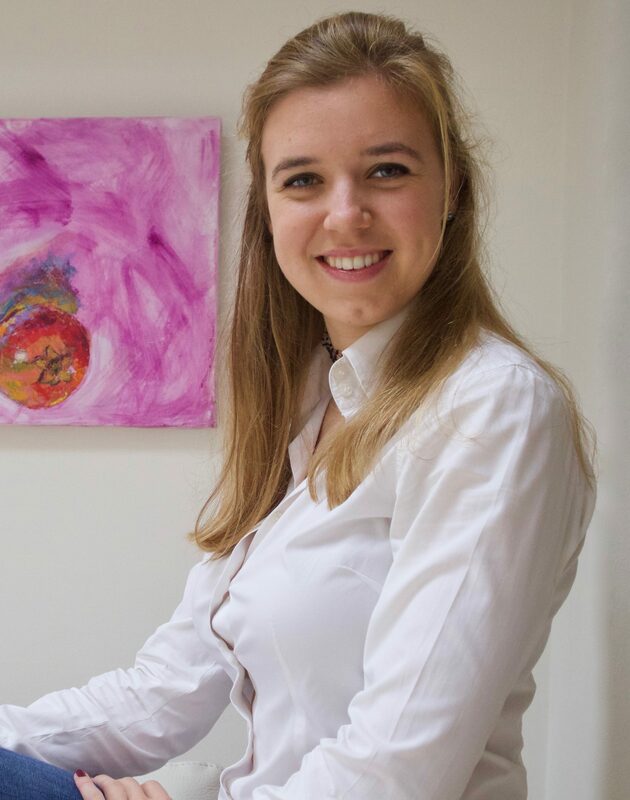 Check out her shop, you wont be disappointed! 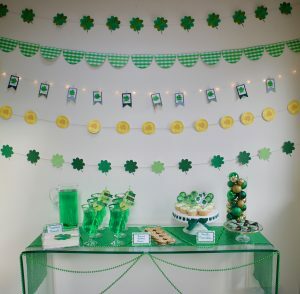 Now lets move on to this St Patrick’s Day decor I’ve been talking about, shall we? I decided on a green & gold theme – pretty standard I know. But green is not a colour I play around with very often. I own so few green items, this wasn’t as straight forward as it should’ve been. Thank goodness for all of Christina’s printables! I’ll post the link to each of the printables if I can find them – I forgot to mention, but she also makes custom designs and made a couple especially for this shoot. 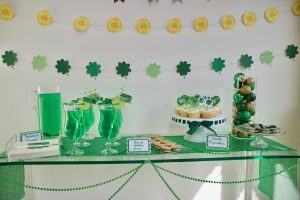 I decided to do a bar setting, something you can easily throw together if you’re having a few friends over – with fun drinks and a few snacks. But lets talk about these fun banners for a minute!! I thought it would look so good to have more than a couple of garlands. At first, I wanted to display them in a messy, disorganised way but my perfectionist self couldn’t bear it. Haha. I’m only half joking. But I just didn’t want it to look too messy. So as you probably guessed it, Christina created each and every one of these designs. I just printed them and assembled them. It was that easy! 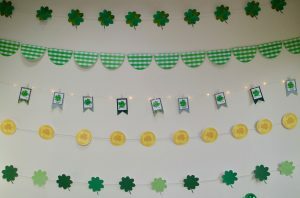 She custom made the coin banner and the two clover banners but you can find the green buffalo plaid banner online and the lit up garland (from Flying Tiger!) is actually made up of gift tags (also from her shop)! But I used them as a banner. Now lets talk about the fun stuff, aka the food and drinks. 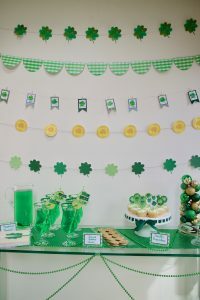 I remember when I was younger my mother had put food colouring in our water jug on Saint Patrick’s Day and I was diiiisgusted. Didn’t touch that green stuff. Hahaha. This time around, I’m making it look a little more appetising in fancy glasses and a few decorative touches. But seriously, its peppermint cordial. Have you ever tried it? 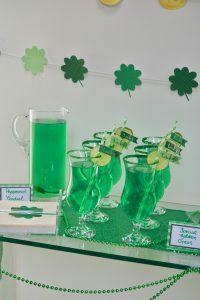 It gives the most intense green colour to your drink, so fun. 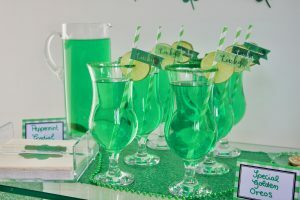 I added a slice of lime to each glass, dipped the rims of the glasses in green sugar – because I’m faaancy haha but seriously its so easy, it may look fancy but all you have to do is grab two bowls, fill one up with water and the other one with your sugar, dip the rim of the glass in water and then in the sugar. Sticks like a charm, 0 mess. I was impressed. 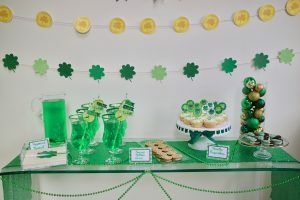 I also added these green paper straws and decorated them with Christina’s straw flags she custom made. It made for VERY appetising drinks! For the food, I made only sweet things – because I’m a sweets lover!! I frosted these cupcakes in a very artisanal way lol you can tell I’m not a baker. 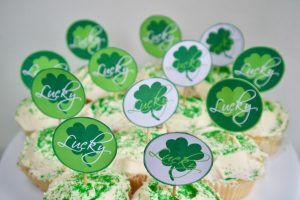 But these cupcake toppers from Sunshine Tulip Design (btw they’re on sale, just in time for St Patty’s!) made up for my lack of icing skills, don’t you think? 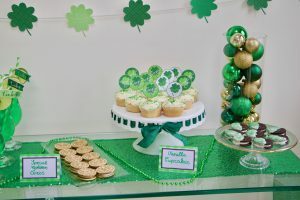 Oh and have I ever mentioned how much I love this cupcake stand? Its so perfect, you can change the ribbon and have it match every table set up you want. I wish I knew where it was from. 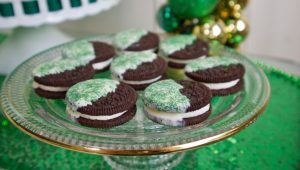 Other than that I made oreos two ways… I mean, I didn’t make them but you know what I mean. Half of them I dipped in white chocolate and green sprinkles. Once again, it was a lot easier than I was expecting. Dip them in the chocolate once, place them on a tray and then grab a spoon and keep pouring some melted chocolate until it hardens so you get a nice thick layer. Then pour your sprinkles and place in the fridge. Pretty yummy! 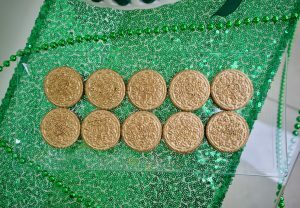 The other half I used edible gold spray paint to make them look like gold coins. I thought they turned out so cute! And so easy to make, once again. Oh and I might have forgotten to mention these tent cards are also from Sunshine Tulip Design. Super versatile, and she sells lots of different colours as well. 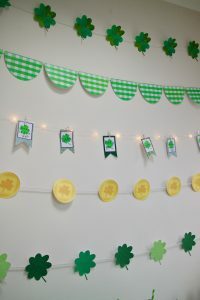 If you’re planning a St Patrick’s Day party, I highly suggest checking out her shop, she sells other items for St Patty’s as well like this cute wall print or this adorable banner, I wish I used for this shoot! What are your plans for St Patrick’s Day? Do you celebrate it where you live? 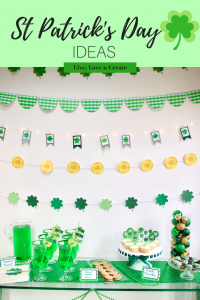 Such cute ideas!! I love the prints and the sweet dessert & cocktail inspiration!! My hubby is Irish so we always have a traditional corned beef & cabbage family meal! 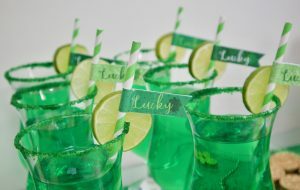 I think I might do some fun drinks since it’s on Saturday… might need to give these a whirl! !